Key difference: Sugar is the generalized name for sweet-flavored food substances. Sucrose, table sugar, is mainly extracted from either sugarcane or sugar beet. Sugar, is available in many forms in the market. Molasses is a by-product of the sugar production process; be it of sugarcane fiber, beets or grapes. Sugar is the generalized name for sweet-flavored food substances. Sugars are categorized as carbohydrates, which are a group of compounds made up of carbon, hydrogen and oxygen. Carbohydrates, and in turn sugars, are the source of chemical energy for living organisms, including humans. Sugars are categorized as monosaccharide, disaccharides and polysaccharides. Monosaccharides are the simplest carbohydrate type, composed of a single molecule. These include glucose, galactose, and fructose. Disaccharides are made up of two molecules. The table sugar, also known as sucrose, most commonly used by humans, is a type of disaccharide. Other disaccharides include maltose and lactose. Sugar, is available in many forms in the market. Some of the forms of sugar available are granulated white sugar or table sugar, superfine (castor or caster) sugar, coarse (decorators or pearl) sugar, crystal sugar, confectioners, powdered or icing sugar, invert sugar, brown sugar, raw sugar, Demerara sugar, Muscovada or Barbados sugar, Turbinado sugar, etc. Each one has its specific uses especially for cooking and baking. The type of sugar used is extremely important, especially in baking. This is true, as the size of the sugar crystal affects the amount of air that can be incorporated into the baking batter, especially during the creaming of the sugar and fat or butter. The size of the crystal will also affect how quickly the sugar will dissolve in the batter. All these factor effect the look, consistency and taste of the finished baking product. 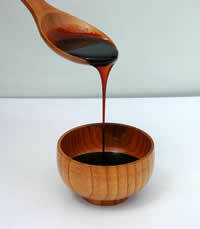 Molasses, on the other hand, is a by-product of the sugar production process; be it of sugarcane fiber, beets or grapes. Still, the most commonly available molasses is that of sugarcane. In order to make molasses, the cane of a sugar plant is harvested and stripped of its leaves. The juice is then extracted usually by cutting, crushing and mashing. The extracted juice is then boiled and concentrated. The concentration of the juice leads to the crystallisation of the sugar, which is whisked out. After the first, boiling the molasses can be packaged and sold as is or may be further processed. If sold, this type of molasses is often termed as ‘cane sugar’ especially in the United States of America, as the syrup still contains most of the sugar content, which has yet to be extracted. Blackstrap molasses is considered healthier than other refined sugars, as it contains trace amounts of vitamins and significant amounts of several minerals. Blackstrap molasses is a source of calcium, magnesium, potassium, and iron; one tablespoon provides up to 20% of the daily value of each of those nutrients. Due to this, blackstrap molasses has long been sold as a health supplement. It is also often used in the manufacture of ethyl alcohol and as an ingredient in cattle feed.